Calcifications associated with LCIS typically occur in adjacent tissues. This neighbourhood calcification is a feature that is unique to LCIS and contributes to its diagnosis. 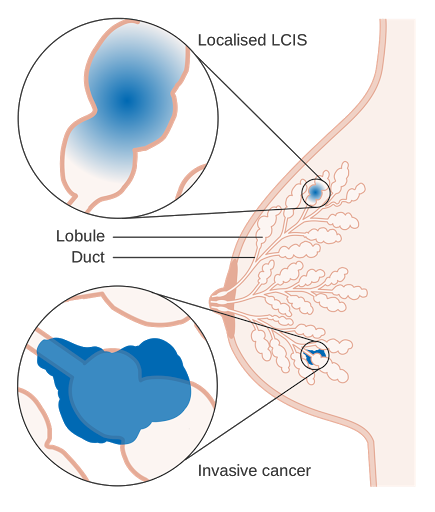 Invasive breast cancer develops in 25% to 35% of women with LCIS. Invasive cancer may develop in either breast, regardless of which breast harbored the initial focus of LCIS, and is detected synchronously with LCIS in 5% of cases. In women with a history of LCIS, up to 65% of subsequent invasive cancers are ductal, not lobular, in origin. Please ask any queries related to this or share your views with other readers.